Jonathan Abrams (right), Manager, Gershow Recycling, and Steve Hughes (second from right), a Bellport resident, pose with some of the children and their chaperones who traveled to Dorney Park & Wildwater Kingdom for the day on August 15. Mr. Hughes, a longtime Gershow customer, organized the trip. 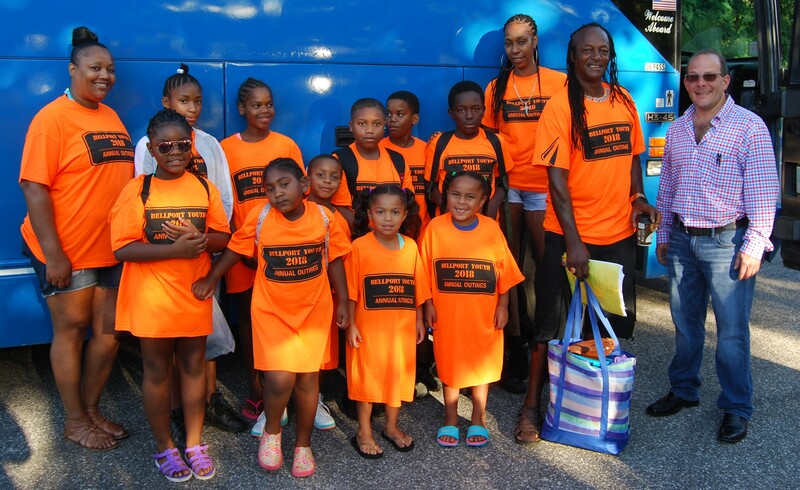 On August 15, more than 30 children and teenagers from the Bellport area boarded a charter bus at Robert Rowley Park for a day of fun and excitement at Dorney Park & Wildwater Kingdom in Allentown, Pennsylvania. Gershow Recycling sponsored the trip, which was organized by Steven Hughes, a Bellport resident and a longtime Gershow customer. Mr. Hughes asked the company for assistance in sponsoring the trip and Gershow agreed. The sponsorship went to cover the costs of transportation and admission to the amusement park. Mr. Hughes personally invited the children to spend a day at Dorney Park, with the families’ permission. The children, whom Mr. Hughes knows from the Bellport community, have few opportunities to travel and socialize with their peers in a fun and positive atmosphere.